Residents make their way along a street in Zhouqu in northwest China's Gansu province Sunday after a deadly flood-triggered landslide. (CNN) -- Massive landslides in northwest China have left at least 127 people dead, with Premier Wen Jiabao urging rescuers Sunday to move quickly to find survivors among the nearly 1,300 still missing from the disaster. "For those who were buried under the debris, now it's the most crucial time to save their lives," Wen said at meeting held near the site of the rain triggered mudslides, Xinhua news agency reported. 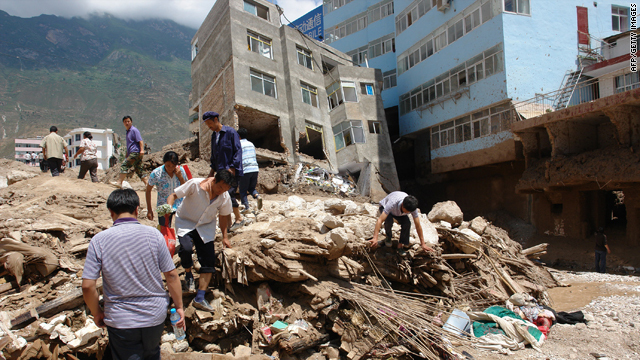 Authorities report 76 people have been injured, and about 45,000 have been evacuated from Zhouqu County in the country's northwest, according to a statement from the provincial civil affairs department. The landslides occurred early Sunday morning after heavy rains started pummeling the area Saturday, authorities said. On Sunday afternoon, Wen and other government officials arrived at the mountainous region to survey the damage, according to Xinhua. Wen also insisted that electricity be restored and traffic resumed in Zhouqu County as soon as possible. The premiere sludged through the mud and rocks in the badly hit Sanyan Valley, where some 300 households were totally submerged by the mudslides, Xinhua reported. The mudslides caused the Bailong River to become obstructed and overflow and sent water rushing over its banks, state-run CCTV reported. The water level in the county seat of Chengguan Township had receded by 40 cm (16 inches) Sunday, after floodwaters carrying mud and rocks submerged half the town, Mao Shengwu, head of the prefecture, told the news agency. "Torrential rains began to fall at around 10 p.m. Saturday. Then there were mudslides, and many people became trapped. Now sludge has become the biggest hindrance to rescue operations. It's too thick to walk or drive through," said an official identified by Xinhua only as Diemujiangteng, head of the county. "Since excavators can't reach the site, we can only use spades and our hands to rescue the buried," He Youxin, an officer with the Gannan branch of the Gansu Headquarters of Chinese People's Armed Police Force, told the news agency. His rescue team has saved 23 people and recovered 15 bodies, he said. But, "It's very hard to locate the people washed away by floods. It's hard to say what their chances of survival are," he said. The news agency said the police rescued two children and three adults who were trapped atop a seven-story building, half of which had been washed away by the flood waters, according to a video clip shot by a police officer shown on Chinese Central Television. More than 300 homes in Yueyuan Village in the county had been buried. But the number of deaths were not known, Mao told the news agency. A total of 600 soldiers arrived at Zhouqu County in China's Gansu Province to perform relief work, Xinhua said. Three other detachments consisting of more than 1,700 soldiers as well as a 180-member medical team are on their way to the affected areas. China's armed police have also sent 2,100 members to help, the news agency reported. By Sunday afternoon, the provincial civil affairs department had sent 3,900 tents, about 40,000 boxes of instant noodles and 31,300 boxes of bottled drinking water to the county. But the county still needs 441 tons (400 metric tonnes) of drinking water and 22 tons (20 tonnes) of instant food, said a spokesman with the prefecture's government, according to Xinhua. The county needs an estimated 11,023 tons (10,000 tonnes) of water and 551 tons (500 tonnes) of instant food in the next 25 days, Xinhua reported.